Ratchet Tie Down straps by CargoLoc are manufactured with premium industrial grade materials for total cargo security. These durable ratchet tie downs feature a new comfortable ergonomic molded rubber grip. The webbing is UV treated for direct sun durability. The polyester webbing has very low elasticity for minimum tie-down stretching. All steel parts are heat treated for additional strength. 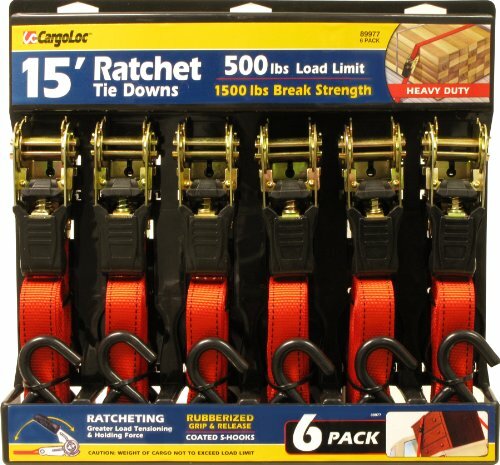 This ratchet tie down has plenty of uses such as moving, travel, camping, building materials,power sports, motorcycles, ATV, 4x4, quad, trailer, mountain bikes, snowmobiles, scooters, lawnmowers, jet skis, boats and anything else under the sun that needs to be tied down and tightly secured. 1 inch x 15 foot tie-down straps are ideal for a wide variety of uses. Coated S-hooks resist scratching and rust, and have 1 inch opening. Ratchet Tie-Downs are the best solution for your everyday medium duty load security.